Welcome to our church in Lee, MA! Click Here - 2 Minute Illustration on the progressive nature of sin! 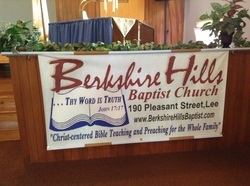 What makes Berkshire Hills Baptist Church so special? Very simply, it is the people. BHBC is a church filled with caring, loving, and friendly people. Our church is here to serve you through regular weekly ministries as well as special activities throughout the year. It is here that relationships are made and where Christ is magnified. Yes, we are growing, and we praise God that so many have found a place to call home. On behalf of everyone here at BHBC, we would love to have you worship the Lord with us. If I can be of any assistance in your spiritual journey, please email me at pastor@berkshirehillsbaptist.com. I look forward to seeing you soon.